The City of St. Charles is holding an Open House to discuss updates to the 2013 Comprehensive Plan that focuses on development in a portion of the downtown. The Open House is April 24, 2019, from 6 p.m. to 8 p.m. in City Council Chambers at the Municipal Building, 2 E. Main St.
Over the next few years, there may be development opportunities coming to the area north of Main Street and south of the old railroad bridge within downtown St. Charles. 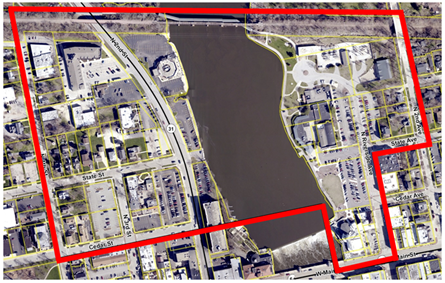 On the east side, the Police Department will be leaving their current facility, and discussions are ongoing about the potential for pedestrian and recreational enhancement to the riverfront in this area. In light of these changes, the City plans to update the vision laid out in the downtown section of the 2013 Comprehensive Plan, which serves as the City’s long-range guide for development. The update will be specific to a focus area north of Main Street, between 2nd Avenue on the east and 4th Street on the west. Open House attendees will learn more about the current Comprehensive Plan, offer feedback, and participate in interactive activities that will help the Plan Commission gauge preferences for the future of our downtown. City staff will be there to provide background information regarding the study area and answer questions. For more information, contact the Community & Economic Development Department at 630.377.4443 or visit the project website: www.stcharlesil.gov/projects/downtown-comprehensive-plan-update.